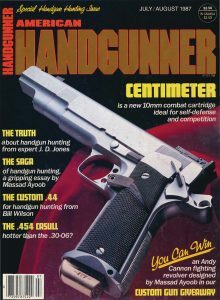 I’ve been writing for American Handgunner magazine for four decades now, and their old “classic” issues are available online at americanhandgunner.com. Lots of knowledge and history archived there. A few days ago I took a stroll down memory lane from an issue that was on the stands some thirty years past, the July-August 1987 edition. 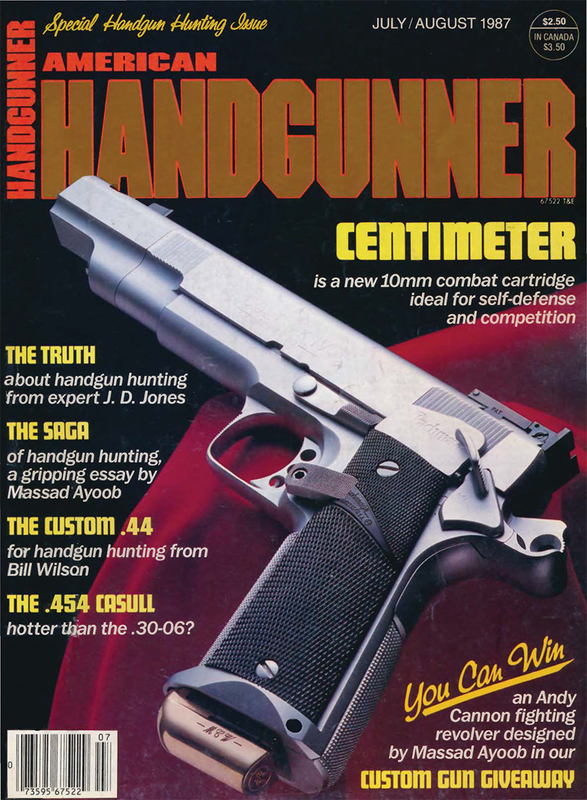 I had an essay in there on hunting (the original title of which had been “Confessions of a Part-Time Handgun Hunter,” and an insider look at a project I had done with one of the great S&W revolversmiths of all time, Andy Cannon. We had created what might have been the ideal police service revolver…at about the time law enforcement was sending revolvers to the police museum and turning en masse to semiautomatic service pistols. We lost Andy much too soon to cancer. I still cherish my Andy Cannon guns, including my prototype of those “Ayoob/Cannon Street L” .357 Magnums. IIRC, I shot it at Bianchi Cup that year. My “Ayoob Files” that issue focused on an Indianapolis case where a cop struggled with a thug, each trying to get the other’s gun away from him. (Spoiler: the cop, a part-time Marion County deputy who was working security at the time, won.) It was one of two cases that prompted me to later develop and teach a disarming/retention technique for that situation. It brought back a lot of memories, and might do the same for my fellow old farts, and give younger folks a taste of 20th Century American gun culture. I remember those days, that was about the time I started reading your stuff in AH religiously. In particular, I remember you calling out a certain Mr. Steiner on point shooting…I enjoyed your well thought out responses to his nonsense. Back then, there wasn’t the resources for LEO’s wanting to read up on legal aspects *after* a shooting, so your advice was very welcomed and well received! 30 years went by too fast. Here’s to another 30, Mas, keep rolling! That Indianapolis situation teaches many lessons that are still critical today. One of course is the value of a backup firearm, but in my opinion a revolver is preferable, largely based on this Ayoob File. Thanks Mas! I have been reading your columns as long as you have been writing them and I just want to take this opportunity to thank you for the knowledge and enjoyment I have received from your efforts. Keep up the good work. From: just another old fart. Quite the stroll… I can’t believe that well over thirty years have passed since I met You and Ray Chapman at a Training Officers course in Portland, Oregon. It’s been a hell of a ride my friend. You made me a better Officer, a better Instructor, and a better shooter. You taught me so much and gave me so many opportunities not to mention my first semi-auto which I still have and cherish. You also have given me your invaluable friendship. Here is to many more years of you spreading the word and being the terrific advocate that you are to so many. Merry Christmas and Happy New Year to You and Yours…. Mas Ayoob articles. I shall seek out your books. You are a National Treasure Mas ! God Bless you. It brings back quite a plethora of memories for me. One of my biggest regrets was having to sell my Street L to buy groceries. That was quite the revolver and I wish I still had it. I can’t believe I’m old enough to have been reading your writings this long. I guess time flies when you’re having fun. I wish you and the Evil Princess a very Merry Christmas and look forward to crossing paths again soon I hope. Mas, I’m a relative newcomer to your writings, having “discovered” your words of wisdom about 6 years ago. However, I’ve wasted little time in catching up, devouring everything I could get my hands on since then. I cannot imagine what the gun world – and not just the gun world – would be like without your contributions. I’ve always heard that one should leave the world a better place and there can be absolutely NO question that Massad Ayoob has done just that. Thanks from one very grateful American. Another interesting article. Really enjoy these that inform us about the history of some things in the gun world. As I recall, back then I was into the .460Rowlamd, and the .464 Rowland (A .460 (lengthened .45 acp case Magnum, necked down to .40 Cal./10 mm), about which I posted the below comments. If you like a 10mm, you should love Johnny’s .460R. One of the main differences, and improvements, over any of the stock higher power pistols available, is the inclusion of a good muzzle brake in the system, which keeps the power of the cartridge from beating the weapon (Many 10mm pistols I am aware of suffered from split frames, or other damaged parts, due to fast travel speed of the slide during recoil, although several recoil spring devices have been offered to hopefully cure that?) to death, as well as the shooter. That muzzle brake is the key to the shoot ability of the .460R/.464R conversions over all of the other hot factory, and wildcat, pistols on the market. It adds an inch to M1911 autos, but aids it sighting, recoil control, recovering sight picture, but most of all it prevents physical damage (assuming it’s not an old pre-1950s made, or junky foreign M1911 clones), doesn’t inflict recoil shyness, even on smaller, more sensitive shooters. The only drawback might be trying to find holsters, as the muzzle brake extends the .460R/.464R M1911s to the same length as a Long Slide M1911. I have included a letter that I wrote a number of years ago, in response to an article toting the virtues of the then new, relatively unknown, 10mm offerings by the gun industry. Re: Your review of the Rock Island Armory 10 mm M1911 on Page 28 of the Current Issue. Reading your review, and your wish for a 6” barrel, took me back to the Johnny Rowland kits I installed on two of my M1911s over 10 years ago. First I built up one M1911 myself, using the Clark Custom Guns .460 Rowland kit, that I bought in support of Johnny’s development of his modification to the .45 ACP version of the M1911, to get more velocity, and power, out the stock M1911 pistol (See John Taffin’s article in the Sept. 2009 issue of Guns Magazine for details of the .460 Rowland conversion). Shortly afterwards I learned that he was also experimenting with another version of the .460 Rowland, necked down to .40 cal./10 mm size, that he called the .464 Rowland, using the .400 Corbon loading dies to neck down the Starline (Only, due to wall thickness, and increased pressure rating) .460 brass to the proper case dominions, then loading it to something in the 1,400 plus fps velocity area. So, I immediately ordered the .464 Rowland conversion kit, from Clark as well, and tried to assemble it, in a manner similar to the .460 Rowland kit, however, I just couldn’t seem to get it properly fitted. At Johnny’s suggestion, I finally sent the pistol, and the .464 kit, back to Clark Custom Guns, where Johnny told me that it was assembled, and test fired by Mr. Clark Sr. Upon its return, of course, it was correctly assembled, and mechanically as tightly fitted as any match grade M1911 I have ever used too. My next problem was to load up ammo to use in it, so I ordered 500 .460 Rowland brass from Starline, a set of .400 Corbon loading dies, and batch of CCI magnum primers, and a few pounds of Accurate #7 powder (Czech Republic), and set about developing a usable load, since Johnny had already decided to drop development of the .464R, as it’s velocity, and power levels, were too close to those of the .460R, and required the use of different dies, and more extra loading steps, than his .460R did. I eventually developed, and tested, the following loading (www.realguns.com/hlbuilder/printhl.php?custcartridge_id=1059) for the .464R, using the Nosier 135 grain JHP bullet (HP 44838), a powder load of 17.0 grains of Accurate #7 (Czech Republic mfg. only), primers CCI 350 LP Magnum. These loads Chronographed at 1,850 fps (+/- 5 fps), and slightly over 1,025 pounds of initial muzzle energy, without more felt recoil than that of a hot .45 ACP loading. Hope this adds to your data on 10mm loadings, provides a way to have a M1911 with more barrel weight, and quite a lot more power, and velocity, than existing 10mm M1911s as well. Well, heck. I thought I was up on everything from the .41 Avenger to the 10mm Centaur, but this is the first I’ve heard of the .464 Rowland! I was intending to build a .38 Casull (which was way out there in .357 Auto Mag territory) and discovered the .40 Super brass from Starline, which looked like it would be a lot easier to neck down, and then figured it, why not just skip the forming step and shoot it as-is? Johnny Rowland has a website you can visit, and find out is he’s still selling the .460Rowland kits, if you decide to build one! Both Clark and Rowland insist the compensator is necessary to prevent damage to the frame and slide. Wilson briefly sold a .460 without a comp, then added one. Unfortunately, I’m one of the people who loathes the look of a pill bottle stock on the end of a 1911; enough that I finally decided that while I loved the .460, I hated the look of the comp more. Not to highjack the thread, but I’ve found it interesting that the “no. 1” police service cartridge, is somewhat eshewed by the shooting public at large, instead favoring the 9mm and, closely, the .45 ACP. I personally see it as a near perfect compromise between the two, especially considering the slightly better terminal ballistic numbers. Steve, you nailed it. They key to the .40’s success in 1990 was that in similar guns (S&W to S&W, for example) the 12-shot .40 exactly split the difference between the 8-shot .45 the “Caliber Advocates” wanted in law enforcement, and the 16-shot 9mm the “Firepower Advocates” wanted. Enough of each to satisfy both sides and get back to the important stuff, tactics and shot placement. When Glock introduced their 16-shot .40 in 9mm size, the G22, it sweetened the pot all the more toward the .40. As an armed citizen, you could carry a 9mm if and when you felt like it, ditto a .45; the compromise factor was not so important in the private sector. I think about the past a lot. Recently I’ve been thinking about Bernard Goetz. I wasn’t a gun owner when he became “The Subway Vigilante.” I want to admire him, but he just fired one too many bullets (or maybe he should have simply shown them the gun, maybe they would have backed off). Mas, if you want to, I would like to hear your take on his story. My guess is he could be the poster child for getting educated about the law if you are going to carry a gun. Fascinating case. His statement “You don’t look too bad, here’s another” was never heard by any of the witnesses in the subway car. He emptied a five-shot Chief Special and inflicted one gunshot wound on each of his four opponents, with one shot going wild into the roof of the subway car. That was established a trial, and is one reason why he was acquitted. Thank you, Mas. What you said is different than the information I got from the Internet, so I am glad I asked you the question! Of course I believe what you said, and it makes more sense. I have seen a video of Bernard Goetz saying that he wanted to kill those guys. Since I study self-defense, I know that we never want to kill anyone, we simply want to stop the attack. That is what leads me to believe that Bernard Goetz didn’t study self-defense as much as the rest of us have. I know there was a follow-up civil trial where Ron Kuby won for the “victim” who was paralyzed. Mr. Goetz is required to pay money to that guy, so he doesn’t work, and pays no money to the bum. So, am I correct in believing that Bernard Goetz is a hero, who was abused by the NYC criminal “justice” system? It would have been interesting to see what Bernard Goetz’ trial would have been like if he had been in a gun-friendly state. Normally I have respect for the self-described communist Ron Kuby, but it makes me mad that he went after BG so rabidly. Handguns with a bore diameter of around 1 centimeter (.40 to .41 caliber) have often been proposed as ideal for police work. The .41 Magnum, 10 mm auto and the .40 S&W were all developed with that role in mind. The driving force behind this concept was that handguns with bore diameters around 9 mm (9 mm Luger, .38 Special, etc.) were inadequate for police work despite a long, worldwide history of use in this area. The .41 Magnum and 10 mm auto were developed with the concept of giving the cartridge as much power as could be reasonably handled. The problem was that the power that someone like an Elmer Keith, Bill Jordan or Jeff Cooper can handle is much more than the power that most police officers can handle. Therefore, the .41 Magnum and 10 mm auto failed (for police work) due to being too powerful. They are more used for hunting than for law enforcement today. The .40 S&W was more successful because the goal was changed. Instead of “maximum reasonable power”, the designers of the .40 S&W set their goal as “just enough power” to meet the FBI test procedure. This allowed for a smaller, light pistol that had controllable recoil in the hands of a typical LE Officer. However, the basic premise that started the whole thing: That the 9 mm is inadequate is being challenged today. With the improvements in ammunition and bullet design, the 9 mm can run with the .40 S&W and .45 ACP in terms of effectiveness. It adds the benefits of even lower recoil, greater magazine capacity and lower cost ammunition. Given all this, it is not surprising that there is a gradual return to using the 9 mm. Not only for personal defense and concealed carry but even for law enforcement use. “In 1963, Elmer Keith and Bill Jordan, with some help from Skeeter Skelton, petitioned Smith & Wesson, Remington, and Norma to produce a pistol and ammunition in .41 caliber which would fall between the extant .357 Magnum and .44 Magnum cartridges in ballistic performance, and at the same time address perceived shortcomings with those loads. While Keith had suggested a softer .41 Special cartridge as early as 1955, this idea was passed over in favor of the Magnum option, and the Special survives only as a custom wildcat cartridge. The .357 Magnum suffered from restricted terminal ballistic effectiveness in the early 1960s, as jacketed hollow point bullets were not yet commonly available, and the manufacturer’s standard loadings consisted of simple lead bullets. The powerful .44 Magnum, primarily a heavy hunting round, was considered overkill for police use, generating too much recoil for control under rapid fire. In addition, the revolvers chambered for the .44 were considered too large, bulky, and heavy for police carry. FYI, I’ve also seen independent corroboration of the .40S&W-equivalent “.41 Police” loadings in print from the late Chuck Karwan. To me, it seems that the Wikipedia article largely agrees with what I said. The goal for the .41 Magnum was set at maximum controllable power. The revolvers chambers for it were large frame, heavy models that were less than ideal for police work. Recoil was too heavy (with full power loads, anyway) for rapid-fire revolver work by an average policeman. The gun failed in its target market (i.e. as a police sidearm). It is true that a lighter load for police work was offered. However, you know how Americans are. Like “Tim the Tool-Man”, we always want “more power”. So, if maximum power loads are on the market, then people are going to reach for them rather than the “watered-down” load. You can actually get now what should have been offered for the .41 at the time, .41 Special cartridges (ala .44 Mag / .44 Special). I have seen loaded ammo somewhere but forget who produced it . However, you can get .41 Special cases for reloading from Starline. In 1963 I was in the Army in Germany and ordered (thru our base Rod 7 Gun club) a Model 58 S&W in .41 mag. I got it BUT couldn’t get ammo. I believe I had the only .41 Mag revolver in Europe but couldn’t shoot it until I got home to the U.S.! “9mm” covers a lot of gound. 9mm NATO or old-spec SAAMI 9mm may physically interchange with Ultra Raptor Ninja Deathmaster Defensive Hammer 9mm (or whatever this week’s new hotness is called), but a lot of modern “defensive” 9mm is loaded *way* hotter than that. As far as .40 caliber wildcat cartridges go, I’ve always found the .400 Cor-Bon to be interesting. This is the .45 ACP case necked down to .40 caliber. It is easy to get a 1911 to shoot this wildcat. Generally, all that is required is a barrel swap. The standard 1911 magazines and recoil spring typically work OK. I have a spare barrel for .400 Cor-Bon that is fitted to my 1911. I also have reloading dies. Brass can be made by just necking down .45 ACP cases. Sometimes a little trimming is also required. Loaded ammo is available from some of the specialized ammunition companies. However, it is expensive. Typically, more than $1 per round. Cheaper to reload your own since .45 ACP brass and .40 caliber bullets are both readily available. The .400 Cor-Bon can be loaded to give ballistics similar to the 10 mm auto. However, it never offered any advantages for IPSC Action Shooting because, unlike the .40 S&W, it does not offer any improvement in magazine capacity over the .45 ACP. The Cor-Bon’s official load is inexplicably mild. The .40 Super is very similar dimensionally, but loaded *much* hotter; the muzzle energy figures are in the .460 Rowland range. Love the .400 Cor-Bon. I have 2 guns (a 1911 built on an Essex frame and a Colt Defender) with .400 barrels. It IS hot and the Defender has an extended, ported barrel to help compensate for muzzle rise. As you said, reloading dies are available and forming brass is easy (and inexpensive). I’m surprised that the .400 Cor-Bon is not more popular than it is. It is off-topic but the Concealed Carry Reciprocity Act of 2017 just passed the U.S. House of Representatives. However, don’t get too excited just yet. It still has to pass the U.S. Senate. You can expect the mainstream media to start foaming at the mouth and you can also expect the gun-grabbers to use every tactic in the book (including scare tactics) to try to kill it in the Senate. They don’t have an Obama veto to back them up anymore. They know that President Trump will sign it. So, now is the time that they will pull out all of the stops. I have already seen claims that they the anti-gun billionaires are pouring millions of dollars into the effort to kill this bill. We will all need to lobby our Senators so as to try to counter-act the gun-grabbers “Scorched-Earth” tactics. This bill still has a big hurdle to pass before it becomes law. I have seen odds on the Internet that only give it a 34% chance! Wow, thirty years gone by that quick. I remember reading American Handgunner back then as well. Great writers in that magazine. Back in the summer 1987, I was a young copper carrying a S&W model 15 in a border patrol style holster with dump pouches. A model 36 was my off duty gun. Boy, as time marched on. A few years ago my wife was diagnosed with cancer (she got better) and I spent a lot of time in waiting rooms. The oncology clinic at the local university wasn’t the first place I would think of to see “American Handgunner” and “Combat Handguns” mixed in along with “Modern Maturity” and “Redbook”, but I was interested to see that they were quite popular, and when I looked over the shoulder of a woman of “a certain age” as I walked by, I noticed she was reading one of Mas’ columns. Well, it was in Dixie after all, but the demographics were surprising. If there will be no printed paper in the future, then when the power goes out, we won’t have anything to read. Maybe you will have to print out your digital magazines, three-hole punch them, and put them in a notebook. I’m sure a technocrat is thinking, “I will put solar panels in my Faraday cage, then when the coronal mass ejection knocks out all power on earth, I’ll use the solar panels to charge my smart phone. Oh yeah, the servers which support the Internet will all be knocked out.” I guess that guy better have his favorite magazines downloaded already. Maybe someone thinks we can harden the grid so it won’t get completely knocked out. My guess is there will still be books and paper magazines in the future. We still have phonograph records, and some people still ride horses and shoot archery. Pencils and hammers haven’t changed much. I still use a rake to rake my leaves, and a shovel for the snow. The newer a machine is, the more delicate it is, and the shorter life span it has. Mas, were your deals with AH and CH for first serial rights, or were they outright sales? Even if the latter, you might get them back just for asking. There are places that can do a pretty good job of scanning page image back into editable text. Bundle them up in book-sized collections, maybe add some commentary about how things have changed over the years, and put them on the market. TRX, as I recall there’s a spot at the end of the Ayoob Files section at http://www.americanhandgunner.com where you can order about 28 years worth of scanned Ayoob Files for cheap.